Today marks an important milestone in the fight against judicial obstruction in Texas. Texas has eleven empty seats in its federal courts. 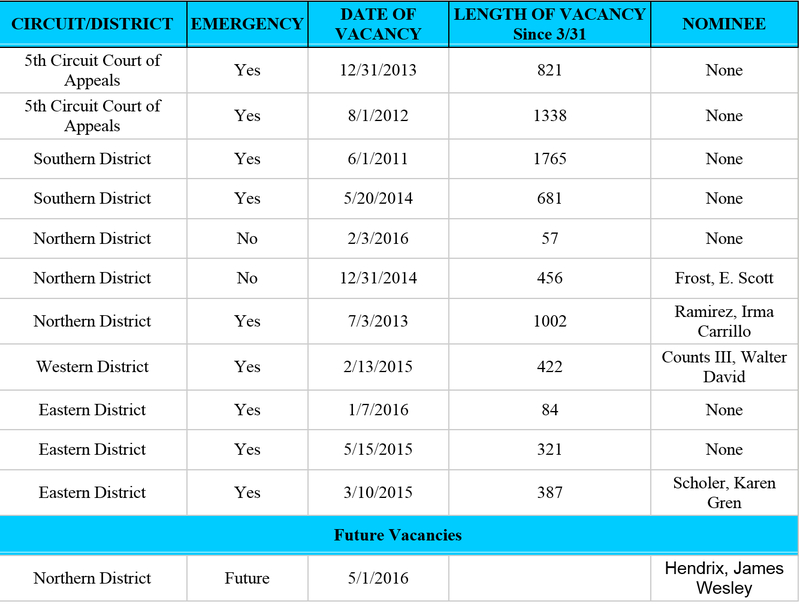 That’s more vacancies than any other state in the country, and a new court vacancy will come up on May 1. When you add the length of those vacancies together, it adds up to twenty years of vacant court seats in Texas’ federal courts. "This disagreement over the Supreme Court is not going to stop my commitment to work across the aisle to help Texas and Texans. And to that end, we've been working with White House on five judicial nominations," Cornyn said. Twenty years of empty court seats is inexcusable. However, admitting there’s a problem is the first step to recovery. We'll see if Senator Cornyn keeps his promise, and gets swift hearings and confirmations for Texas' nominees. And hopefully, as he does, he's able to continue working with the White House and fill the remaining vacancies as soon as possible. A full list of Texas' judicial vacancies can be found here, or in the table below.